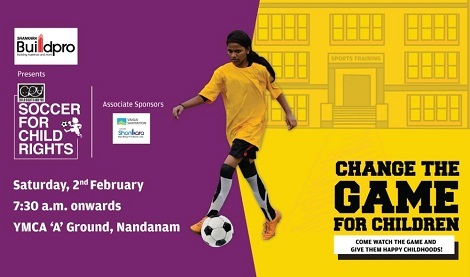 Come watch corporate teams play against some of the best players from the slums of Vyasarpadi in the original tournament that is now in 4 cities! All proceeds go to Child Rights and You and aid in our efforts to ensure that children across the country have access to happy, healthy, creative childhoods. Started in 2014, Soccer for Child Rights is an annual tournament that aims at bridging the gap between two strata of our society through sport. Employees from corporates participate to play for the children CRY work with, while also using the platform to network amongst themselves. In the last 4 years we have seen the tournament grow to become an event that is hailed as a one-of-a-kind initiative that exchanges inspiration, stories, courage, and hope; all over a friendly game of football. The tournament that was started in Chennai, has today spread its wings in Bangalore, Kolkata and Delhi snow-balling the cause into a movement.